Station Hollywood: Saira Banu played different characters in her long career. Saira Banu played different characters in her long career. The viewers of bollywood films wish happy birthday to Saira Banu on 23rd August, 2017. She used to be called beauty-queen of the 60s. Acting was there in her blood with her mother Nasim Banu doing well in many films in the 40s. Saira Banu started her career with the film Junglee opposite Shammi Kapoor in 1961. The brilliant music of Shankar Jaikishan given in the film and exotic locations of Jammu and Kashmir flabbergasted the audience in the early 60s. All the songs in the film were super hit including “suku suku”, “meri yaar shabba khair”, “ehsaan tera hoga mujhpar”, “Kashmir ki kali hun mai”, to name a few. From that time onwards Saira Banu started getting stylish roles one after the other in bollywood films. Saira Banu went on to give hit after hit with Biswajeet and Joy Mukherjee as well. With Biswajeet her film April Fool released in 1964 became super hit. The songs of SJ again created storm including “april fool banaya”, “aa gale lag jaa”, etc. With Joy Mukherjee Saira Banu’s film Shagird stormed box-office in 1967. All the songs of Rafi and Lata were hits including “dil vil pyar vyar”, “woh hai zara khafa khafa”, “o bare miya diwane”, “duniya mehfil hai”, etc. The music was composed by Laxmikant Pyarellal. 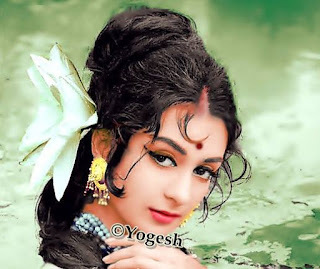 Saira Banu exhibited the character of village girl who was sought after by her teacher played by IS Johar, but fell in love with Joy Mukherjee in the film. There were other hit films of Saira Banu like Saaz Aur Awaaz opposite Joy Mukherjee, Aadmi Aur Insaan opposite Dharmender, to name a few. Saira Banu’s combination with Rajender Kumar was well accepted by the audience. All the three films opposite Jubilee Kumar including Ayee Milan Ki Bela in 1964, Aman in 1967 and Jhuk Gaya Aasman in 1968 became super hit. The songs of all those films composed by SJ again struck box-office. Prominent songs included “o priya kaun hai jo sapno me aya”, “tum khamseen ho”, “kahan chal diye”, “surahidar garden”, etc. Saira Banu balanced the powerful performance of Rajender Kumar in those films. In Aman, Saira Banu played the role of a Japanese girl. In Ayee Milan Ki Bela she played the role of an urbanized girl having wealthy background. In Jhuk Gaya Aasman, she played the role of a sophisticated girl coming from middle-class family who was involved with Rajender Kumar who was guide in Darjeeling, but after reincarnation led the life of a wealthy industrialist. May be after Sadhna, Saira Banu was accepted by the viewers the most opposite Rajender Kumar. After marrying Dilip Kumar, Saira Banu acted in a number of films opposite him including Sagina, Gopi and Bairaag, most of which did well in the box-office. Sagina was directed by Dada Saheb Phalke winning director Tapan Sinha, who made the Bengali version and the hindi version of the same film separately. Saira Banu acted opposite Dilip Kumar in both the films. Her films with Raj Kapoor titled Diwana and Dev Anand titled Par Muhabbat did good business mainly due to hit music of Shankar Jaikishan. The songs of those films including “ai sanam jisne tujhe chaand si surat di hai”, “dil ki awaz khuda khair Karen” still remain the landmarks of Indian film music. Even Saira Banu’s comedy films like Parosan opposite Sunil Dutt, Kishore Kumar and Mehmood did brilliant business. From the mid-70s Saira Banu faded away from the industry before acting in films opposite Big B like Zameer and Hera Pheri. There were other films of Saira Banu opposite other stars like Manoj Kumar in the film Purab Aur Paschim, Dharmender in Resham Ki Dori. The viewers expect her to contribute in bollywood films in character roles again.